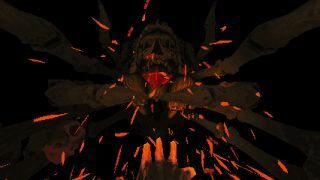 Devil Daggers is “a fast-paced shooter that places you in an abyssal arena to face endless legions of demons,” being developed by a team that includes one of the guys behind the most excellent Dustforce. It hit Steam Greenlight last October and made the cut in short order, and today the developers announced that it will go live on February 18. The name of the game is simply to “fight to survive as long as you can,” but no matter how well you do, it doesn't sound like you'll be drawing breath for long: Players will be ranked on global leaderboards, and “precious seconds” will separate the winners from the also-rans. There are 13 enemies in all, and nothing to throw at them but daggers. Fortunately, your daggers are magical, upgradeable, and can be thrown—fired, I suppose—in very rapid, Stab-O-Matic fashion. OpenGL 3.3 was released in early 2010, by the way. That's a far cry from the 90s, but still an interesting little factoid. You can find out more about the game on Steam, or at devildaggers.com.